SecureAnywhere keeps you secure - world-class protection, game-changing performance. You can browse with confidence knowing you're protected. You can use Webroot's preconfigured folder called the Webroot Anywhere folder or you can create your own sync folders. Any files you place in these folders are automatically synchronized to any other computers with shared folders associated with your account, and to mobile devices with the Backup & Sync app installed. SecureAnywhere constantly monitors the Anywhere folder and other sync folders. If the system detects a change, such as an edited file, a new file, or a deleted file, it immediately makes the same change to your online backups, to shared folders on other computers, and to mobile devices with the Backup & Sync app installed. If you are working offline, SecureAnywhere automatically picks up changes the next time you connect to the Internet. If SecureAnywhere detects an edited file, it does not overwrite the original version stored in your account. Instead, it uploads the latest version and makes a copy of the original file. If necessary, you can revert back to previous versions, up to five. If you save changes a sixth time, your most recent version is saved and the oldest version is removed. Instead of synchronizing files with multiple devices, you can simply back them up. For example, you may want to back up tax returns, old photos, and a scanned copy of your passport. These types of documents won’t change and don’t need to be kept in synchronization with other computers. Webroot SecureAnywhere delivers complete protection against viruses, spyware, and other online threats without slowing down PC performance or disrupting your normal activities. With its fast scans and threat removal, you can rest assured that malware is eliminated quickly and easily. 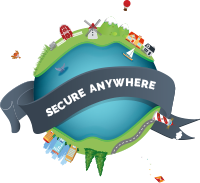 SecureAnywhere gives you the freedom to surf, share, shop, and bank online — all with the confidence that your PC and your identity will be kept safe.